Kapuso fans are now thrilled about the upcoming shows of GMA that are all set to air this year. Teasers of these new programs were just recently aired. GMA is introducing a whole new and fresh concept in the reality singing competition genre as it brings together the country's top concert performers to scrutinize the contenders. Led by Asia's Songbird Regine Velasquez, The Clash also casts Asia's Nightingale Lani Misalucha, Comedy Concert Queen Ai Ai Delas Alas and Asia's Romantic Balladeer Christian Bautista as the show's panelists. The new singing competition will be hosted by the first team-up of Andre Paras and Joyce Pring. It was Regine who hosted some of the most successful singing competitions in GMA such as Pinoy Pop Superstar, Search for a Star and Are You The Next Big Star? so it is a no-brainer that The Clash would have a huge following too. These shows produced some of the big names now in the music industry such as Rachelle Ann Go, Jona, and Aicelle Santos. The Clash is scheduled to air on July 7. Homegrown talent Bea Binene is back to another afternoon teleserye where she will be working for the first time with the newest Kapuso recruit Sunshine Cruz. This new TV series will touch on a very controversial story as both Sunshine and Bea will be playing mother and daughter roles who will both fall in the same guy (played by Benjamin Alves). Also part of the powerhouse cast are Zoren Legaspi, Bing Loyzaga and David Licauco. 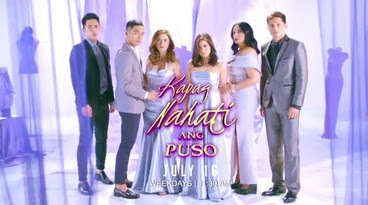 The show's original title was Karibal Ko Ang Aking Ina. Kapag Nahati Ang Puso will replace My Guitar Princess in the morning timeslot. Another powerhast cast teleserye is the primetime series Onanay. This will mark the return of Superstar Ms. Nora Aunor in doing a teleserye. Her last one was also with GMA, the Kris Bernal-starrer Little Nanay. Originally entitled Extraordinary Love, the newest Kapuso star Jo Berry will play the title role. Prime actress Cherie Gil will also join the cast along with Encantadia darlings Mikee Quintos and Kate Valdez. This year's biggest Kapuso telefantasya is also coming soon! Pambansang Bae Alden Richards will play the Thor-like character of Victor Magtanggol. He will be joined by a returning Kapuso Ms. Connie Reyes and the bubbly kid Yuan Francisco. The trailer looks good from the costume to the effects. Hopefully, the story is also good.